Bonn, 10 October 2017- A multinational plan to thwart the sudden and severe decline in vultures across Africa, Asia and Europe will be presented at a major summit on migratory species this month. Experts estimate the majority of African-Eurasian Vultures are critically endangered and at “very high risk” of extinction in the wild, mainly due to poisoning. Unless effective conservation measures are implemented, there is a significant likelihood that several of these species will become extinct in the near future, they say. The Convention on Migratory Species (CMS), which spearheaded the Action Plan, says a ‘step change’ in conservation is required: “It needs to be led by Governments and supported by all who have a vested interest, including many who have so far not recognized the importance of vultures,” said Bradnee Chambers, Executive Secretary of CMS. 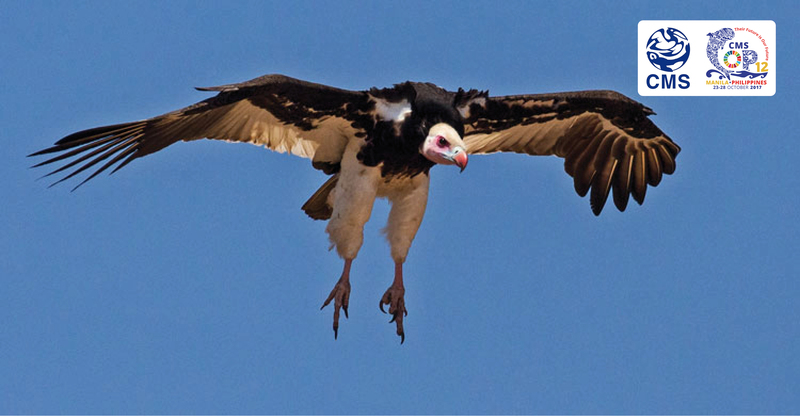 The Multi-species Action Plan to Conserve African-Eurasian Vultures aims to rapidly halt current population declines in 15 species across most of the combined landmasses of Africa and Eurasia. It recommends 124 actions for countries to take to restore numbers by 2029. “When we meet in the Philippines at COP12 it is incumbent on all range states to take the threat seriously. Vultures are important to humans and we ignore their desperate plight at our peril,” Dr Chambers added. The Action Plan includes developing guidelines, targeted research and monitoring, policy and legislative changes, education and awareness, and conservation initiatives. It covers the Bearded Vulture; Egyptian Vulture; Red-headed Vulture; White-headed Vulture; Hooded Vulture; Himalayan Griffon; White-rumped Vulture; White-backed Vulture; Indian Vulture; Slender-billed Vulture; Cape Vulture; Rüppell’s Vulture; Griffon Vulture; Cinereous Vulture; and Lappet-faced Vulture. According to the CMS-led team of authors, vulture populations in Africa, Asia and Europe – with the exception of Western Europe – are in serious decline. They cite intentional and unintentional poisoning as the main cause. “The precipitous population decline of three species in India and elsewhere in South Asia during the 1990s was due primarily to secondary poisoning by the veterinary drug diclofenac. In Africa, the threat of indirect and intentional poisoning has accelerated in recent years, and the immense scale and impact has only recently been exposed,” they say. Other threats include habitat loss and degradation, decreasing food availability, fragmentation of remaining populations, human disturbance, collisions with wind turbines and power lines, and electrocution on electricity infrastructure.